Listen, I know it's pretty easy to draw a snarky comparison between Nine Parchments and fellow co-op twin-stick spell-based... thing, Magicka, but if our own experience with the game is to be believed, there's a substantial amount of difference between the two. 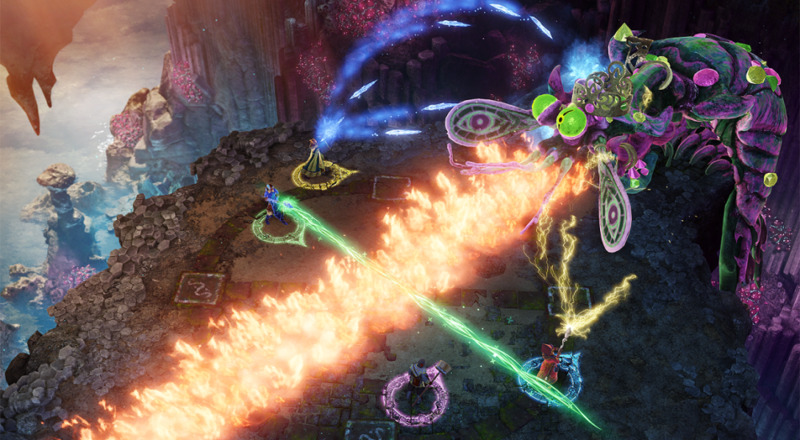 For example, Nine Parchments is about to be out on Xbox One, a console the Magicka series never touched. March 7th, to be exact. So, you know, stick that in your pipe and make a snide remark about it. The game had always been planned for release on Microsoft's home console, but a firm date hadn't yet been announced for the four player co-op title. In it, you take on the role of a student in the Astral Academy, who is tasked with finding the titular parchments in order to graduate. If you're curious about the gameplay, check out the launch trailer below. If I know my co-op crew, not a single one of us will be picking spells that are even remotely helpful to each other, which is probably for the best. The developer, Frozenbyte, is known primarily for the excellent Trine trilogy, so quite a bit of co-op pedigree has gone into their latest release. I'm hopeful for Nine Parchment's success, partially because I love seeing co-op games do well, and partially because I want Frozenbyte to keep making games so I can hang out in gorgeously designed levels with my "friends" (see above) for as long as humanly possible. Page created in 0.9704 seconds.